Blogging and other types of social media such as wikis and social networking sites have transformed the way we use the internet in recent years. It is a transformation that business is eager to exploit. In order to do so, a clear commercial strategy needs to be established; does your organization wish to use the media actively as a business tool, or do you need to respond to the use of social media by others? Blogging and Other Social Media will address this question with practical guidance on using social media as well as the risks associated with it. A collaboration by leading thinkers and business users of social media, the book contains detailed and practical advice on the various forms of social media - their applications, advantages and disadvantages, how these technologies are evolving, and whether or not their use will benefit your business. The section covering social media and the law explains the risks and remedies related to abuse of copyright, defamation, privacy, data protection and user contracts as well as the opportunities and threats for online reputation. If you are looking to encourage your employees but want to protect your business from the threats this emerging media presents, get a copy of this practical guide and study it before you start including social media as part of your corporate marketing or communications strategy. Contents: Foreword. Part 1 Blogs: Introduction to blogs; Creating a blog; Writing a blog; Enhancing the blogging experience; Is blogging worthwhile for a business? Part 2 Social Media: Introduction to social media; Professional networks for businesses; Consumer-oriented media; Wikis; Online office applications; Podcasting and videocasting; Social bookmarking and the 'online content democracy'; Forerunners to social media; Social media case studies and conclusions . Part 3 Using Social Media Internally: Social tools inside the enterprise - Lee Bryant; Elements of 'Enterprise 2.0' - Lee Bryant; Social media case studies and conclusions- Lee Bryant. Part 4 Social Media and the Law: The law of social media - Mills and Reeve; Online reputation - Colin Samuels, Alex Newson and Justin Patten; Index. 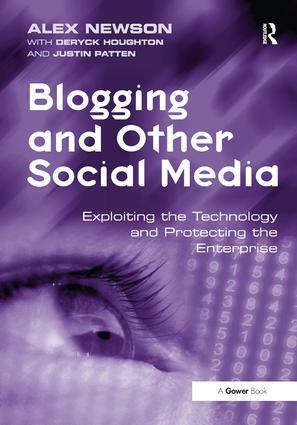 This is a book by several authors who have been brought together by their use of social media. The authors come from a diverse range of backgrounds such as business, academia, law and, of course, new media. The Editors Alex Newson and Deryck Houghton are the authors of IMPACTÂ® , the award winning blog of law firm Freeth Cartwright LLP, Alex Newson has since moved to Shoosmiths. Justin Patten is a Solicitor and Technology Catalyst working at the law firm Human Law, he is author the law blog 'Human Law' which is part of the American Lawyer Media's highly select 'legal blog network'.